August 24, 2013 August 24, 2013 Posted in Travel Posts. I know what your expecting by now, yeah things have not gone too well travel wise over the last few days so you by now are expecting some drama. Well I hate to disappoint you, read on. Getting up was fine, in fact I was up early, I showered and was ready and out the hotel by 04:30, I was the other side of Don Mueng Border control just after 05:00, I had two hours to kill and spent most of it by trying to remove Thai Baht from my pocket and spending it. Plane was on time and I arrived in Kuala Lampur around 10:00 (GMT +8) with nothing to do for a few hours. I started my laptop, wrote a piece (which you should of already read by now) and changed the rest of my Thai Baht into Malaysian Ringet so I could grab a coffee. I go to the ATM, tap in the relevant digits to try and get ¥30,000 out of the bank (nearly £200) the bank says no. I check another ATM, denied, time to call the bank. 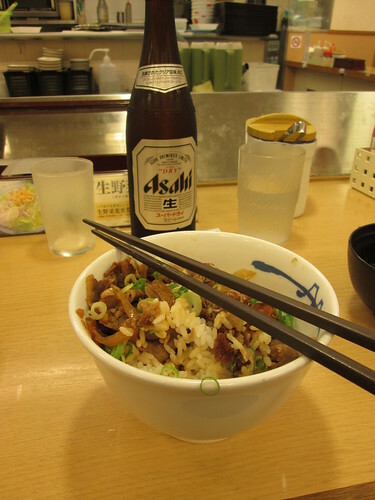 Luckily there is free Wifi at Kansai airport (this has been my saviour) and via Skype had a conversation with my bank. This has not been the first time I have had to slap my bank and to be honest I am getting tired of it. I send them a secure message telling them where I am going to be and when and for how long and they still get it wrong. Not having the time, money or patience to argue with the bank I just get them to fix it so I can get some money, kerching!! Next the bus. Again using the power of the internets I look for the bus from Kansai to where I need to be. I’ve missed the last one, scuzzmonkies! That means I am at the airport for the night or in a hotel. There are no phone cards available in the Airport so I use Skype again on the remaining battery I have and explain to my host that I won’t be there until tomorrow morning, Now to find a bed. Fairly close to any airport is normally a hotel that just asks for your credit card and picks a random number and then charges you just to have a bed. Sure enough the Nikko the fees in here are totally ridiculous, one night is ¥19,000 (£120). This makes staying awake or sleeping at the airport a viable option. Finally I go upstairs to find food and find two Aussie pilots sinking a beer and this is where life changes again. In my basic Japanese I ask if it’s okay if I eat and they say yes and point me at this machine (view this big just to get a feel for the amazing thing it is). I’ve annotated it for you on Flickr but here is a rough explanation. There is no actual food in this machine, all it does is issue you a ticket in order to get you food. 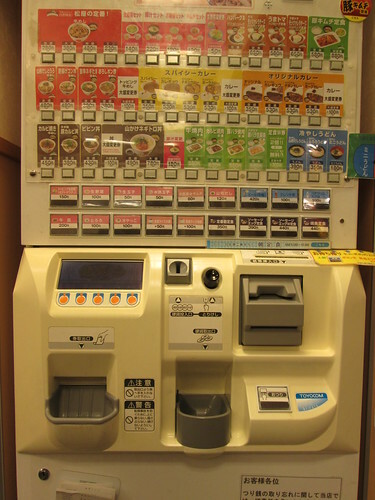 You basically put your money in, press button of the noms you want, collect your receipt(s), press the magic button to get your change and hand the receipt(s) to the operative in the shop. Who accepts it, and within minutes turns up with something edible this for the grand price of £3 per dish (or thereabouts). I paid an extra £2 for the beer because I think I have earned it and then find myself a space next to some power to power up my stuff and write this blog. Yep I am not sleeping or I am just gonna hole up here until 5am until other things in the airport open.